GraphQL is a way to send data over HTTP and is often presented as a revolutionary new way to think about APIs and seen as the successor of REST (Representational State Transfer). Indeed GraphQL is able to overcome major shortcomings of REST. GraphQL can be user in any application, web application or mobile app. In this tutorial you’ll learn how to use GraphQL in a React web application. To make use of GraphQL inside your React project we’ll be using the React Apollo library. Many consider GraphQL as a replacement for REST which is quite inaccurate. REST (Representational State Transfer) is an API design architecture used on network-based software to transfer the data. It has many limitations. It could require multiple round trips to fetch related resources. Another common problem is under-fetching ( not getting everything in one go), or over-fetching ( getting more than what is needed in one go. In the user API, if we have to give out some new field and deprecate few old ones, we’ll have to do API versioning (keep the old version to support old clients and create a new version for new clients). In long run maintaining different versions for same resource becomes a nightmare. You have to announce when will you be deprecating old versions or force your users to update to the latest version, etc. With graphQL you can get all the resources in one single http call, just the way you do in server side by using joins and getting all the data in one SQL. Above is an example of a GQL for displaying last 5 posts with recent 2 comments of a user with id 10. As you can see we got all the 3 resources in a single http call. In the example above, we can add/remove the fields we want. Thus the data transfer over network is controlled by client and not by server, saving both processing and network time. The query part is done by client, so client can add and remove the data it wants as long as it is present on server side without changing API version. Let’s dig into the topic of the post, which is getting started with graphQL in React. Although we went through a basic introduction of graphQL, this tutorial assumes that you are already familiar with React and implementing a simple React app. Now we will take a look at how to use graphQL in react. 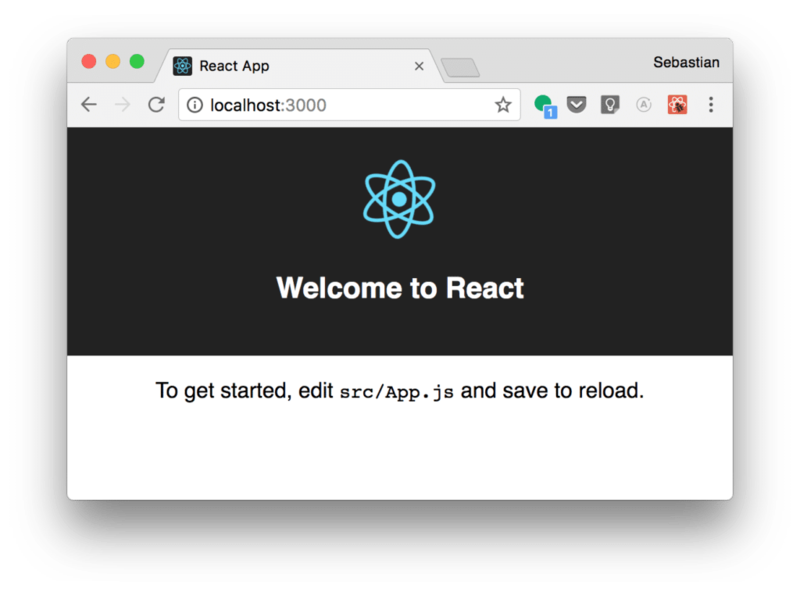 To get started we first need to setup a new React project. The easiest way to do so is to use create-react-app. This script creates a new React project with zero build configuration. The project’s website can be found at https://github.com/facebook/create-react-app. With our project in place and packages added, we can now setup the Apollo client. The client setup couldn’t be easier. We’ll initiate a client and give it the URI to our GraphQL server endpoint and then use the ApolloProvider component to to make the client available in our app’s components. We initialize the client with an HttpLink that points to our GraphQL endpoint and then also specify Apollo’s InMemoryCache as the caching utility. We use the ApolloProvider component, pass it our client as prop and then wrap it around our App component. Now that everything’s in place, we can start running queries against the GraphQL endpoint. For this, we’ll use React Apollo’s Query component, which makes use of the render prop pattern to give us the data back from the query. React Apollo’s Query component takes a required query prop with a GraphQL query that has been parsed using graphql-tag’s gql. Query also takes a required childrenprop that should be a function. Here we also passed-in a variable prop to provide a variable value to our query. Query can also take a number of optional props like pollInterval, fetchPolicy, errorPolicy and delay, among others. The function passed to the children prop receives an object with a handful of useful properties. Here we’re making use of data, error and loading, but other properties like networkStatus, refetch and fetchMore are also available. The data property holds the data received back from the query, the error property holds an error object, if any, and the loading property will be true while the query is in-flight. Please let us know if we miss here something or some correction needed. Thanks for the post. Although there is some correction needed. Can you add the github code for above example ? Hey Rima , Please can you let us know the correction needed here. Also we will provide you the github code. We are working on that now. Just for information don’t you think all these things you can do in REST Full API too,?